Over two hundred nautical miles from mainland Greece the Dodecanese islands are much closer to Asia Minor and Turkey than to Greece. Because of their strategic and vulnerable position in the southeastern part of the Aegean Sea they have suffered more invasions and occupations than the rest of Greece. The presence of fossilised sea shells on some of the islands, notably on the slopes of Rhodes, shows that the islands were formed from the sea bed in the area by earthquakes. The name originated in 1908, meaning Twelve Islands, when twelve of the more than 200 islands in the archipelago united against the newly formed Young Turk-led Ottoman parliament which withdrew liberties that the occupying sultans had previously granted the people in the islands. After World War II the Dodecanese passed from British administration to the Greek Government on 7 March, 1948. Rhodes is, by far, the largest of the islands and is the capital and administrative centre of the Dodecanese. It has a long history, with a legacy left by invaders over the centuries, most notably the years (1309 to 1522) it was occupied by the Order of the Knights of St. John – considered as one of Rhodes’ most flourishing periods. The next article in REFLECTIONS will be devoted to Rhodes. Some of the other islands are worth a visit, such as Symi, Tilos, Chalki and Alimia. 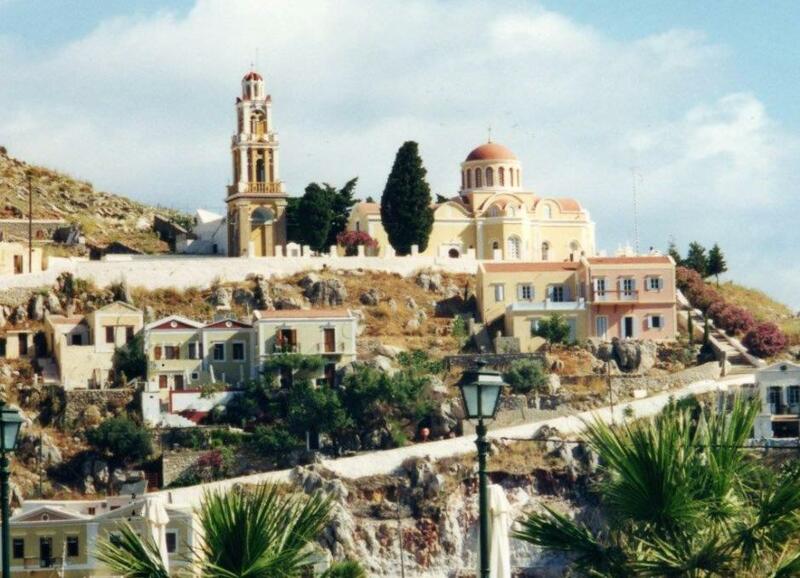 Symi is particularly interesting because the surrender of German forces in the region to the British took place on 8 May, 1945, on the island. where it is commemorated by a monument. An article on SYMI originally published in Issue 205 of Pittwater Online News, March 8-14 2015 is reproduced below. Panoramic view of Symi Harbour. Clock tower on the point. Church of Moni Agiou Giorgio on headland beyond. The delightful Greek Island of Symi, part of the Dodecanese island chain, once was richer and more populous than Rhodes. 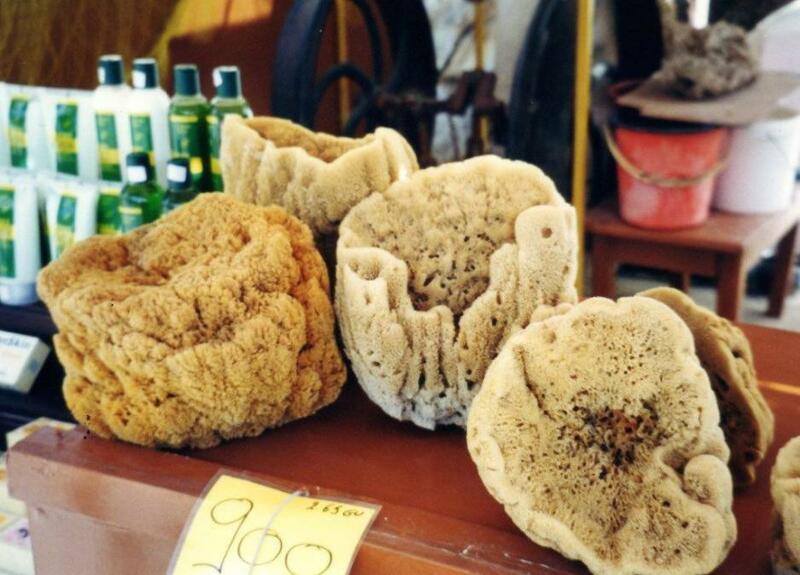 With the collapse of the natural sponge trade and the decline in boat-building its population fell from 22,500 at the end of the nineteenth Century to the present 2,500. Its fortunes are now improving with the growth of tourism – mainly daytrippers from Rhodes but also tourists who stay for several days. From Easter to early November the number of people on the island increases to as much as 6,000. Half of the current population is engaged in commerce and tourism – hotels, restaurants and transport. The island is 67 square kilometres in area and at the nearest point is 5 miles from the Turkish coastline. It is mostly covered by rocks. Its coastline alternates between isolated coves, and rocky cliffs and beaches. Symi was part of the Roman Empire, followed by the Byzantine Empire, until conquered by the Knights of St. John in 1373. In 1522 it became part of the Ottoman Empire but was allowed to retain many of its privileges. During the 20th Century it changed hands several times – occupied by Italy in 1923 and Nazi Germany in October 1943. 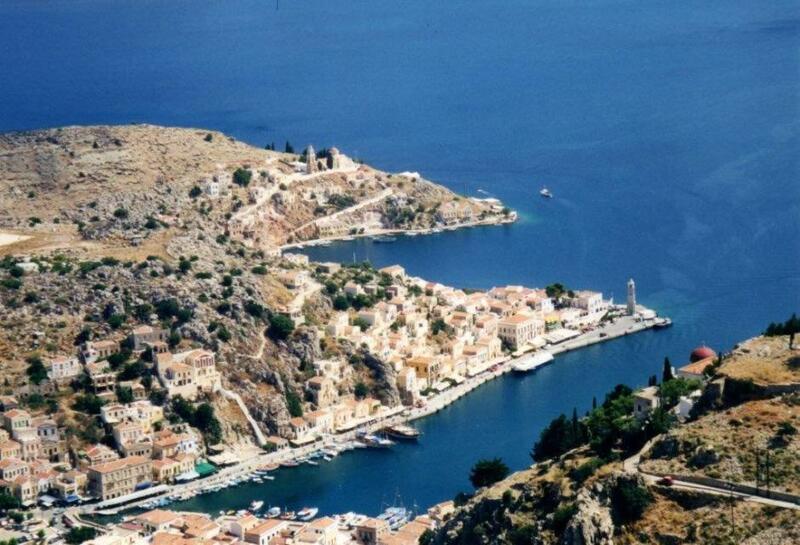 The surrender of German forces in the region to the British at the end of World War II took place on Symi. The British remained in occupation for three years before the island rejoined Greece in 1948. 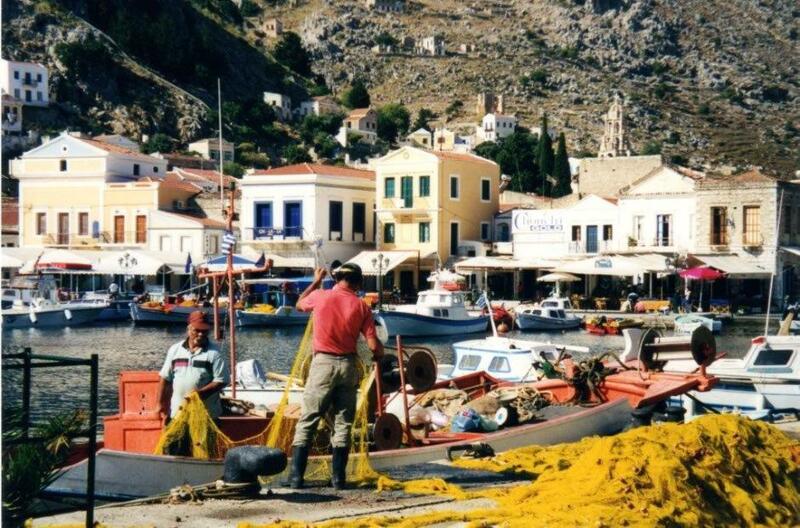 The main town of the island Symi (also called Symi) is on the northeast coast with a picturesque harbour. The lower town around the harbour is referred to as Yialous (Gialous) and the upper town is called Horio (Chorio) or Ano Symi. Symi devotees recognise it as an authentic Dodecanese gem and are particularly drawn by its neoclassical houses stacked around the steep-sided bay, all now subject to a Greek preservation order. A road from the waterfront to above the houses of the upper town provides spectacular views over the harbour and the lower town. It then provides access to the south to Pedi Beach and its pleasant boutique hotel on the beachfront. Turning in another direction the road passes through a cypress forest on the way to Panormitis Bay the site of the island’s monastery of St Michael of Panormitis, a place of pilgrimage for people from all over the world. Monastery of the Archangel Michael Panormitis on Panormitis Bay. The monastery is a large 18th Century Venetian styled building. Its baroque bell tower is said to be the highest in the world. The façade is white and stretches along the waterfront on either side of the gateway. The church which houses the icon of Archangel Michael Panormitis is inside the monastery grounds. Archangel Panormitis is the island’s patron saint and also regarded as the guardian of sailors in the entire Dodecanese area. The date of construction of the church is unknown but some suggest it was built in 450 CE over the site of an ancient temple dedicated to the pagan god Apollo. Although Symi is seen by some as a “backwater” it is, without doubt, worth a visit particularly if in Rhodes – it is only a day-trip away. Church of Moni Agiou Giorgio. 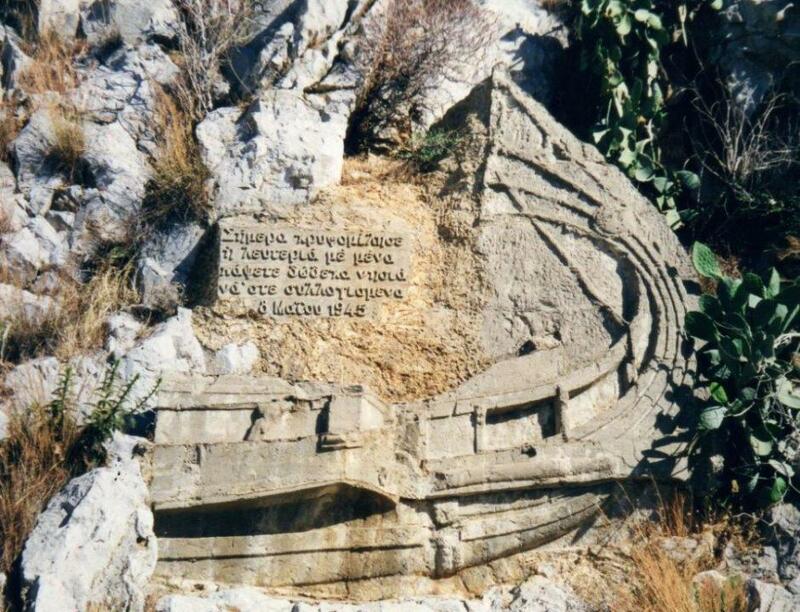 Monument marking the Nazi surrender of Dodecanese to the British on 8 May, 1945.